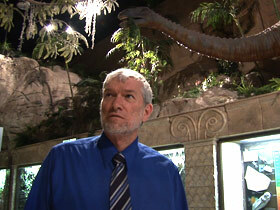 LUCKY SEVERSON, correspondent: This is the Creation Museum in northern Kentucky. It’s a big place with lots of exhibits depicting the creation of the earth in six days, just as it occurred in the Book of Genesis. Ken Ham, a former high school science teacher from Australia, is the CEO of the Christian ministry that created the museum. 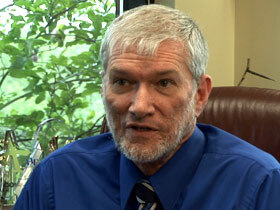 KEN HAM: I’d say the Creation Museum, what’s happened here is way above our expectations. It exceeded all of our visions and dreams. SEVERSON: He says some of the 1.3 million visitors who’ve come here in the last four years are simply curious, but a majority, like Danella and Donna from Indianapolis, are believers. MUSEUM VISITOR: The Bible is the Bible, you know. God created the earth and all of it in 6 days. Can’t argue with God. SEVERSON: It’s a place where homo sapiens and dinosaurs live together in harmony, where Adam and Eve explore the Garden of Eden, and Noah builds an ark loaded with creatures small and large, even dinosaurs. Ken Ham now has plans to build his own ark, a really big one, much longer than a football field, all part of a huge theme park called the Ark Encounter. He says his ark will have the same dimensions as the one described in the Book of Genesis. HAM (speaking on radio): Genesis, could it be a metaphor? SEVERSON: Ham delivers his views about the ark and creation in 90-second radio spots that air, he says, on over 600 radio stations nationwide. 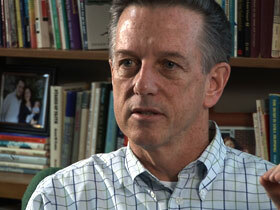 He says his views are gaining traction, although they are not yet widely accepted in the religious community. But it’s not Ham’s version of the creation that troubles Reverend Joseph Phelps, pastor of the Highland Baptist Church in Louisville. 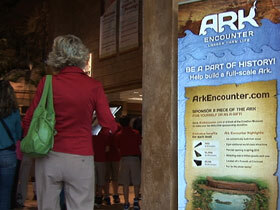 It’s the tax break that has been approved for the ark park. REV. JOSEPH PHELPS: I honor anyone who has a different understanding of creation than I or my church might have. That’s not the problem at all. It’s when, as in the case of the theme park, when they want to ask for public monies in order to fund putting out their particular point of view. That’s where we have a problem. HAM: It’s not really a tax break, it’s a tourism incentive, and what it is, it’s actually a rebate on the sales tax generated at the particular facility. SEVERSON: What it is is a tax rebate that would allow the ark park to recoup more than $37 million in sales taxes. Under Kentucky’s Tourism Act, any company that promotes tourism is entitled to a rebate. The Creation Museum is considered a nonprofit ministry, but the ark park is intended to return a profit to its private investors. Pastor Phelps and other religious leaders argue that the tax break would violate the separation of church and state. JOSEPH PHELPS: Well, first of all, I think it’s unconstitutional. I think to put out a particular religious point of view, such as that theme park, or if it was an evolution theme park, either one of those points of view, if they’re coming from a religious vantage point, cannot be merged with government funding, government support. HAM: Don’t we have freedom of religion in this country? Don’t we have freedom of speech? So if you were a Christian, and you happened to be running a business that happens to have a Christian theme but you are a for-profit business, why is that different to a secular business that’s running something that just doesn’t happen to have a Christian theme? SEVERSON: The conundrum here is that Kentucky desperately needs jobs. HAM: The Ark Encounter is going to employ almost a thousand people, and the impact on the number of jobs associated with that is going to be in the thousands, and our particular research has shown it will be many thousands, and it will bring millions and millions of dollars into the community. In fact, the research that we did shows that the economic impact of the Ark Encounter project over 10 years will be something like $4 billion. SEVERSON: Kentucky’s Democratic governor supports the tax incentives. He says he wasn’t elected to debate religion, he was elected to create jobs, especially in hard-hit communities like Williamstown near where the ark park will be located and where a majority of the unemployed have been out of jobs for over two years. WADE GUTMAN: The city and the county both are in desperate need like every place in the country for revenue, and this will generate a tremendous amount of revenue. SEVERSON: Wade Gutman is the head of the Industrial Development Office and the Chamber of Commerce for Grant County. He says he has slept with a smile on his face ever since he heard the theme park was going to be in his backyard. GUTMAN: I would have a definitely different feeling if it was nonprofit. But since it is for-profit, and it will create so many jobs and boost our economy almost immediately once construction starts, I couldn’t find anything to be against it about. DAN PHELPS: In the original story, Noah basically built the ark on his own shekel. He didn’t have any government funding or anything like that involved. 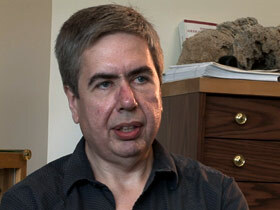 SEVERSON: Dan Phelps is president of the Kentucky Paleontological Society. He joins other academics who say the theme park sends the wrong message about Kentucky. DAN PHELPS: They’re doing it on the aegis of saying that this will bring a lot of jobs to the state, and it might bring a large number of low-paying jobs to the state, but it’s definitely hurt the image of Kentucky. Jay Leno has already joked about Kentucky and the ark on his monologue on at least two different occasions. SEVERSON: But Phelps’s biggest concern isn’t Kentucky’s image. It’s the message the theme park will send to the state’s high school and college students. DAN PHELPS: Almost every year here in Kentucky we have attempts to get laws enacted into the state legislature that would promote creationism, and right now outside of the larger cities a lot of students aren’t learning very much about evolution. The textbooks soft-peddle it. The teachers tend to avoid the subject basically for fear of offending people, and the Creation Museum and the ark park can only make this worse in Kentucky. HAM: So in other words they only want their particular view presented. They want their view of millions of years and evolution and there’s no God presented. They really don’t want someone like us having the freedom to present this particular position. SEVERSON: Ham has not minced words in his views of mainline churches that don’t espouse a literal translation of the creation. HAM: Yes, I would say that churches aren’t doing their job if they’re not teaching the Book of Genesis as it is meant to be taken, because many churches, unfortunately, have taken man’s ideas of millions of years of evolution and then they reinterpret the Book of Genesis., and what we would say is, while we wouldn’t question their Christian testimony in regard to their salvation, we would say that they are really undermining the authority of God’s word. JOSEPH PHELPS: I don’t preach against creationism, but I would say that the majority of our church would support an evolutionary understanding of how God created this world. SEVERSON: And they would support your position against giving them this tax break? PHELPS: Yes, this church is a strong supporter of the separation of church and state. SEVERSON: According to some interpretations of the Book of Genesis, it took Noah about a hundred years to build the ark. The Ark Encounter is scheduled to launch in three years. 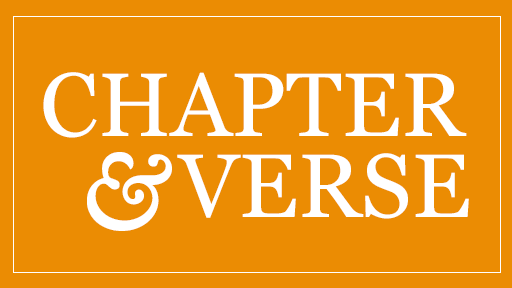 For Religion & Ethics NewsWeekly, I’m Lucky Severson in Petersburg, Kentucky.